Happy Friday! 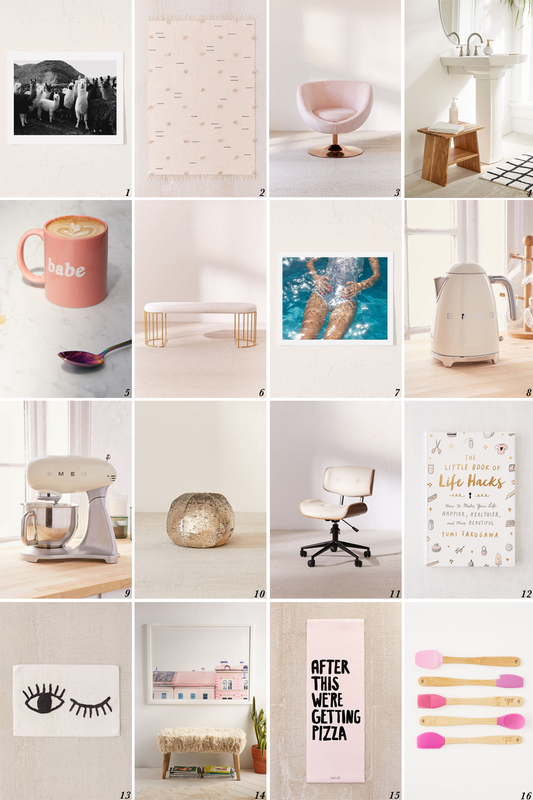 It's been so long since I've blogged about anything that I thought my first post back after the holidays would be some home items that I've been eye'ing. Had to give you guys something good since it's been so long! I do plan on doing a new year's post but seeing as how I can't seem to get my thoughts together in a cohesive manner, it's going to take just a few more days for me to finish it. Sorry! More in my post about it all, promise! Okay, so the best part about the items I'm sharing today are it's all on sale and they're all from the same retailer, Urban Outfitters. Which means you save on shipping. Can we say woohoo to that! Just a few thoughts on the above. 1. Llamas Family Print: I don't know what it is about llamas, but they just make me so happy. And seeing a family of them makes me even happier. 3. Josey Swivel Chair: Another item that I think would be so fun to have in the girls' playroom. They don't have much comfy seating in their playroom, and I could see this growing with them. 4. Kanae Bath Stool: Not the most exciting item here, but oh so practical and at the same time simple & chic. 5. Babe Mug: You guys know I love a good mug, and the color and the typography and the cheeky text totally got me. 6. Canary Bench: This bench is just $299 and looks so much more high-end than that price point. It would add such a glam feel to any space, but I'm thinking at the foot of our bed would be amazing. 7. Lars Botten Les Dents De La Mer Art Print: I'm always drawn to prints that are of the ocean or pool. It just gives me this sense of calm and I just think happy thoughts because I think of the beach or spending the day at the pool. And especially during this time of year, I'm just longing to go somewhere warm. 8. SMEG Electric Kettle: We've been drinking a lot of tea the past month (obsessed with Trader Joe's Candy Cane Decaf Green Tea) and this would make it easy to have hot water on hand all the time. 9. SMEG Standing Mixer: How pretty is this mixer? I love the retro vibes and that it comes in a pretty pink too. 10. Mermaid Reversible Sequin Pillow Pouf: Cora's been obsessed with the reversible sequins on pillows and I can just imagine how much she would love this pouf in her room. 11. Lombardi Adjustable Desk Chair: Now, I have no idea if this is comfortable or not, but it sure does look it and is quite chic too. Steve's been in search of a new desk chair, we might have to get this for him to try out. 12. The Little Book of Life Hacks By Yumi Sakugawa: Anything to make life easier, I am ALL for. Add to cart is all I have to say. 13. Winky Eye Bath Mat: Another item I'm loving for Cora & Vivi. It's cute and simple in color, meaning you can add color with other accessories in the space. 14. Kimberley Dhollander Dreamy Houses Art Print: The colors in this print are what drew me to it, and I think it would be a great addition to any gallery wall. 15. ban.do We’re Getting Pizza Yoga Mat: This yoga mat totally gets me. Definitely pizza after working out, right? 16. Core Bamboo Mini Silicone Cooking Utensil Set: I'm such a sucker for the color pink (it also comes in a blue color way if pink isn't your thing) and for anything mini. This would be so great for when I bake with the girls. This is such an informative post. Thanks for sharing this post.